The Connecticut River Watershed Council, Inc., now doing business as the Connecticut River Conservancy (CRC), and the Deerfield River Watershed Association (DRWA) hereby move for leave to intervene to the above referenced application for license filed by Bear Swamp Power Company LLC (BSPC) on March 30, 2018, pursuant to the Notice of Application Accepted for Filing, Soliciting Motions to Intervene and Protests, Ready for Environmental Analysis, and Soliciting Comments, Recommendations, Terms and Conditions, and Prescriptions dated January 30, 2019, published by the Commission and Rule 214 of the Commission’s Rules of Practice, 18 C.F.R. § 385.214 and related authority and orders. This Motion to Intervene clearly states CRC’s and DRWA’s position and specifies the bases for its position. The facts below demonstrate that CRC and DRWA and their members have interests that are directly affected by this proceeding. CRC’s and DRWA’s intervention is also in the public interest. The Bear Swamp Project is located on the Deerfield River in the towns of Florida, Rowe, and Charlemont in western Massachusetts. The project consists of two developments, the 600 MW Bear Swamp Pumped Storage Development (BSPS) and the 10 MW Fife Brook Dam. The Fife Brook Dam creates the lower reservoir for BSPS. The Project is downstream of the Deerfield No. 5 hydropower development (FERC Project No. 2323) that discharges into the Fife Brook impoundment. The Deerfield No. 4 development (FERC Project No. 2323) is located 17 miles downstream of the Fife Brook Dam. The upstream and downstream facilities are both owned by Great River Hydro LLC. The Bear Swamp Project is currently undergoing relicensing, and is the only project on the Deerfield River that was not part of the relicensing effort that happened in 1994. As such, there are cumulative effects of the projects that can not necessarily be addressed in this licensing. The 1994 Deerfield River Project Settlement Agreement (“1994 Settlement Agreement”) stipulated the minimum flows coming from each of the projects. Facilities can opt to discharge higher than the minimum flow without violating the terms of the Settlement Agreement. Under the terms of the 1994 Settlement Agreement, minimum flows from Fife Brook Dam are 125 cfs on a year-round basis. BSPC is required to schedule generation to provide whitewater recreation on 106 days annually. Recreation flows are a minimum of 700 cfs, according to the 1994 Settlement Agreement, but due to changes in the river downstream of the dam, it is believed that the flows released for recreation are actually closer to 800 cfs. Based on BSPC’s Water Quality Study, water temperatures downstream from Fife Brook Dam often exceed the state threshold for Class B waters with the Cold Water qualifier during the summer months. 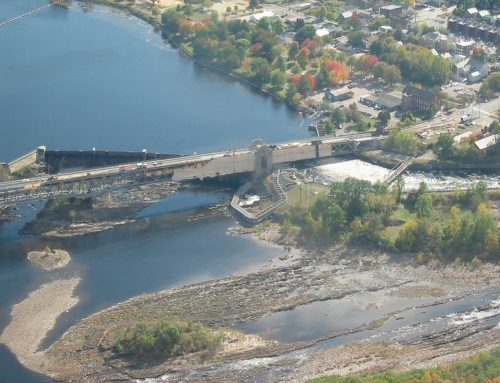 The Fife Brook Dam generates power in a peaking mode, resulting in significant with-in day flow fluctuations between the required minimum flow release of 125 cfs and maximum generation flows of approximately 1,400 cfs. Large and rapid changes in peaking flows from hydroelectric projects cause adverse effects on habitat and biota downstream of hydropeaking discharges (Cushman 1985; Bain et al. 1988; Layzer et al. 1989; Blinn et al. 1995; Freeman et al. 2001). Noted impacts from Fife Brook Dam include changes in macroinvertebrate community with distance downstream of the dam (Cole 2007; Cole 2014). Peaking operations also have been shown to be detrimental to trout spawning and rearing (Person 2013; NAI 1998; Vollset et al. 2016). CRC, along with other stakeholders, repeatedly requested an Instream Flow Incremental Methodology (IFIM) Study, but our requests were denied. A 17-mile-long section of the Deerfield River below Fife Brook Dam contains habitat that supports native riverine species, including brook trout and the state-listed longnose sucker, as well as an important recreational fishery for stocked and naturalized brown and rainbow trout. The Deerfield River Chapter of Trout Unlimited (TU) sponsored a trout spawning survey in 2017, and the results demonstrated that the current 125 cfs minimum flow does not adequately protect the more than 100 documented trout redds in the major spawning area below the Fife Brook Dam and upstream of the Route 2 bridge (Cole 2018). Shallow or no water over redds leaves eggs and/or fry at high risk of freezing, dehydration, suffocation, and/or predation. The odonate risk assessment in the State-Listed Odonate Survey indicated that fluctuating water levels from Fife Brook Dam operations may affect state-listed odonate species. The Fife Brook impoundment section of the Deerfield River is not accessible to the public. Generation and recreation releases from Fife Brook Dam can present a safety hazard for anglers wading in the water. The Warning System Effectiveness Study indicated that the current warning system is audible only within a half mile of the dam. The Flow Attenuation Study showed that the current practice of holding an initial release for 15 minutes to allow anglers time to get out of the water is not an effective means of slowing the increasing water levels in a way that would adequately warn anglers. 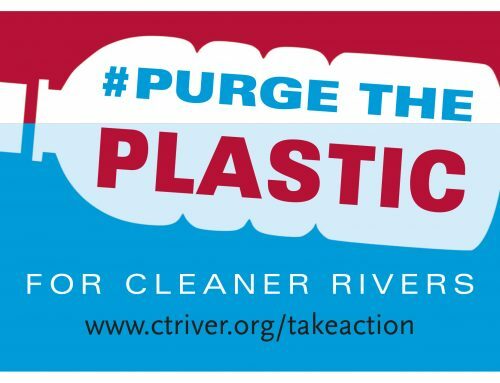 The Connecticut River Conservancy (CRC) is a nonprofit citizen group that was established in 1952 as the Connecticut River Watershed Council, Inc. (CRWC) to advocate for the protection, restoration, and sustainable use of the Connecticut River and its four-state watershed. The interests and goals represented by CRC include, but are not limited to, improving water quality; enhancing habitat for fish and other aquatic biota; safeguarding and improving wildlife habitat; protecting threatened and endangered species; protecting wetlands; preserving undeveloped shore lands; enhancing public recreation and promoting recreational safety; protecting aesthetic values; protecting archeological, cultural, and historical resources; fostering sustainable economic development, energy production, and preserving the local tax base along the Connecticut River and its tributaries. CRC has been an active stakeholder participating in the ongoing relicensing of Northfield Mountain (No. 2485), Turners Falls Dam (No. 1889), Vernon Dam (No. 1904), Bellows Falls Dam (No. 1855), and Wilder Dam (No. 1892). CRWC was an intervenor in the relicensing of Holyoke Dam (FERC No. 2004), Canaan Dam (No. 7528), and Fifteen Mile Falls (No. 2077) projects on the Connecticut River; CRWC was not a signatory to the Deerfield River Project Settlement Agreement in 1994. 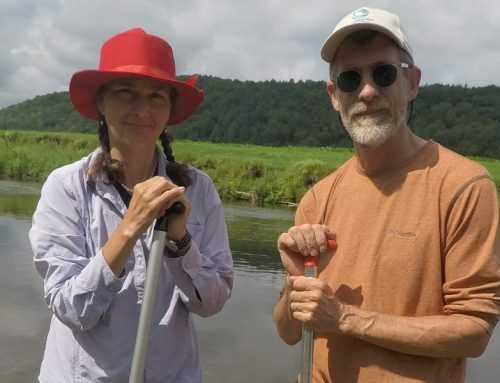 The Deerfield River Watershed Association (DRWA) is a nonprofit citizen group that was established in 1994 to advocate for the protection, restoration, and sustainable use of the Deerfield River and its two-state watershed. DRWA is party to the 1994 Deerfield River Project Settlement Agreement. In 2017, DRWA became affiliated with the Connecticut River Conservancy. The interests and goals represented by DRWA are similar to CRC’s and include, but are not limited to, improving water quality; enhancing habitat for fish and other aquatic biota; safeguarding and improving wildlife habitat; protecting threatened and endangered species; protecting wetlands; preserving undeveloped shore lands; enhancing public recreation; promoting recreational safety; protecting aesthetic values; protecting archeological, cultural, and historical resources; fostering sustainable and responsible economic development, and energy production; and preserving the local tax base along the Deerfield River and its tributaries. 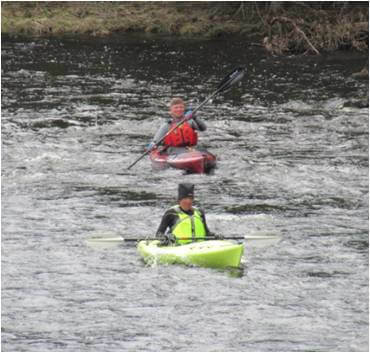 CRC and DRWA members regularly and frequently use the Deerfield River for boating, floating, swimming, fishing, hiking, and enjoying its scenic beauty. CRC and DRWA members are concerned about the area of the Deerfield River affected by the presence and operation of the Fife Brook Dam, including portions of the river downstream of the project area affected by scheduled recreational whitewater releases and operational flows. No other parties to this proceeding represent our interests. FERC has authority over the operations of this facility and can act to minimize impacts. A new license will involve a balance between power generation and environmental quality. DRWA submitted its primary comment to FERC in a later dated March 21, 2019. What follows are comments and recommendations prepared by CRC. In its Final License Application (FLA) dated March 30, 2018, BSPC proposed enhancements that will have a one-time cost of approximately $160,000 and an annual cost of $35,000, for (typically) a 40-year license. Compare this to their 2016 gross revenue of $42 million. The project’s estimated operation and maintenance expenses are $9 million, for a net revenue of $33 million. CRC believes that the impacts of the project’s operations merit a higher investment in mitigation and enhancement expenses. CRC supports the recreational enhancements proposed by BSPC. In addition to those, CRC offers the following recommendations. Increase winter minimum flows. Require minimum flows from November 1 to April 15 of 350 cfs to ensure adequate water depth for trout nests. Continue 125 cfs minimum flow for April 16 to October 31. BSPC has not modeled this scenario. Table E-16 in the FLA showed results for a seasonal winter flow of 275 cfs with a different season, and also a slower ramp rate. This table indicates minimal impacts to generation and to recreation flows. The recommended flow now will likely have a minimal impact as well. An IFIM Study is still needed. FERC should require a full IFIM study now and when the Deerfield River Projects come up for relicensing in 19 years. There is a need to evaluate flow proposals now and in the next relicensing in order to balance project operation with habitat and recreation interests. Slower ramping for operational and recreational releases. For ecological habitat and recreation safety reasons, changes in flows from Fife Brook Dam should come at a slower pace. Without an IFIM, it is difficult to recommend a specific rate. In lieu of project-specific information, we recommend that for recreation flows, there be a mid-way release (if it’s 800 cfs, then increase is 800-125 = 675/2 =337 cfs. A flow of 125+337 =462 cfs (approximately) should be held for one hour before increasing to 800. For higher operational flows, there should be a 2-step process that involves two intermediate flows that are each held for an hour. At the end of a release, the flow attenuation study showed that water elevations decline a bit more gradually, especially further away from Fife Brook Dam. The hold period could be for 30 minutes rather than an hour. Establish recreational access to the Fife Brook impoundment. Public access should be restored to this section of the Deerfield River. Users need reliable flow information from Fife Brook. River users need to know when river levels are changing and at what time they changed. The new Brookfield website, safewaters.com, gives the current flow and the short term schedule. There is no way to know what time the current flow started, which is a crucial piece of information for those who are downstream and need to know when the flows at Fife Brook will reach their location for boating or fishing. Brookfield should re-instate a graph of the flows that show the previous 24 hours of operations. 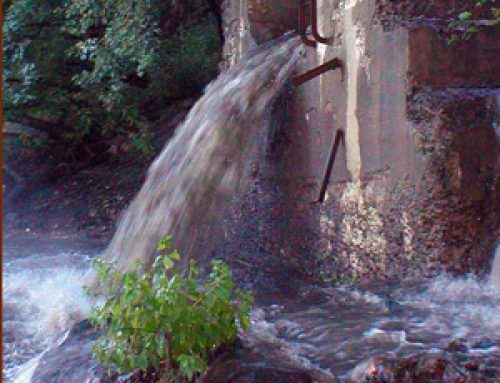 Better yet, a flow gage below the dam should be installed and be made available to the public on a real-time basis. A new warning system is needed , such as lights along Zoar Road, of impending flow release (if ramping is significantly slowed, this may not be necessary). The Warning System Effectiveness Study showed that the current warning system is not very effective, unless you are within 0.5 miles of the dam. BSPC should install Wifi or cell coverage in the project area. The Deerfield valley is remote and in the case of an emergency, it is difficult to access 911 and it’s difficult to refer to river flow website. Hand rails for safety. Install hand rails on all project-owned stairways leading to Deerfield River. This will facilitate safe entry into water for all ages and abilities. Tree replacement plan at Zoar Picnic area. BSPC should prepare a succession plan for the trees that provide shading in the Zoar Picnic area, with phased tree replacements over the course of many years so that clear cutting without shading does not happen. The trees at Zoar Picnic area are all mature trees (red pine?) that are likely going to reach the end of their useful life span within the next 40 years. The shading in the picnic and parking area is a valuable feature of this spot and should be maintained as such. Dunbar picnic area, located along the Deerfield River and owned by Great River Hydro, was clear cut a few years ago and the aesthetics were greatly reduced. This kind of situation should be avoided at Zoar Picnic area. Regular recreation reporting. Now that the Form 80 requirement has been eliminated by FERC, there should be a requirement in the license that BSPC report out recreational use information, shoreline public access, and recreational expenditures and revenues on a periodic basis, such as every 5-10 years. Summer releases. Summer releases from Fife Brook Dam should be shifted earlier in the day (TU recommendation is by 10 AM). The Water Quality Study showed that the lower reach of the river above the No. 4 dam does not meet Class B cold water standards. A whitewater release of 700 cfs, or example, will reach the East Charlemont Boat ramp 7 hours later, according to https://www.zoaroutdoor.com/schedule.htm. So, contrary to the argument presented in the FLA, earlier releases will improve water temperatures downstream in the flat section of the Deerfield River later in the day. Figure E-24 in the FLA used to demonstrate BSPC’s argument does not show results for the Purinton Road water quality monitoring site on days when there are recreational releases, so does not demonstrate the point. Portable toilets at Shunpike. CRC agrees with DRWA’s comments filed that recommend establishing portable toilets at the Shunpike rest area. Land conservation. BSPC proposes to discontinue a license-term Conservation Agreement for the 1,256 acres of land around the upper and lower reservoirs. In addition, BSPC proposes to remove over 170 acres from the project boundary, including 109 acres of land currently protected by this Conservation Agreement. CRC agrees with the comments filed by the Appalachian Mountain Club, American Whitewater, and New England FLOW on March 28, 2019. Very few details have been provided about this proposal. We also agree with the National Park Service comments dated March 27, 2019 that the Conservation Agreement land should be placed under a permanent Conservation Restriction or a new license-term Conservation Agreement. CRC concurs that for the 170 acres to be removed from the project boundary, a land conservation conveyance would need to be ensured. Recreation flows. The whitewater stakeholders have recommended that the scheduled whitewater releases be shifted from 800 cfs in practice to 900 cfs. Trout Unlimited has recommended that the scheduled whitewater releases be kept at the 700 cfs flow that is written into the current license. CRC acknowledges that the Whitewater Boating Study found that 900 cfs was the optimal flow for almost all water craft. On the other hand, studies have shown that peaking flows can have a major effect on aquatic biota, and the bigger the difference between the minimum flow and the peak flow, the larger the impacts. CRC and other stakeholders requested an IFIM Study, but that study request was denied. Without any site-specific data showing us how a regular change from the minimum flow to 700, 800, and 900 cfs on a subdaily schedule impacts aquatic biota, we have to assume it worsens as the flows increase. However, we aren’t able to evaluate the trade-offs between recreational benefit and habitat degradation. We do know that 700 cfs is widely regarded as inadequate for whitewater activities. 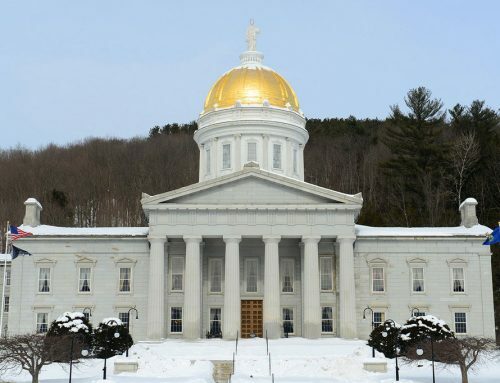 FERC should re-issue the license, and make an attempt to get all hydropower projects on the Deerfield River system synchronized on the same relicensing schedule. The terms of the license for Bear Swamp and Fife Brook should be expanded to include measures recommended by CRC, DRWA, and project stakeholders. We respectfully request that the Commission allow CRC and DRWA to become parties to this proceeding. DATED this 1st day of April, 2019, on behalf of the Connecticut River Conservancy and the Deerfield River Watershed Association. Bain, M.B., J.T. Finn and H.E. Booke. 1988. Streamflow regulation and fish community structure. Ecology 69(2): 382-392. Blinn, W., J.P. Shannon, L.E. Stevens and J.P. Carder. 1995. Consequences of fluctuating discharge for lotic communities. Journal of the North American Benthological Society 14: 233-248. Cole, M.B. 2007. Assessment of benthic macroinvertebrate communities in relation to regulated flows in the Deerfield River, Massachusetts. ABR, Inc. Environmental Research & Services. Cole, M.B. 2014. Deerfield River 2013 comprehensive ecological assessment. Cole Ecological, Inc.
Cole, M.B. 2018. 2017 Deerfield River Watershed Trout Spawning Surveys. Final Report prepared for Deerfield River Watershed Chapter of Trout Unlimited. April, 2018. Cushman, R.M. 1985. Review of ecological effects of rapidly varying flows downstream from hydroelectric facilities. North American Journal of Fisheries Management 5: 330-339. Freeman, M.C., Z.H. Bowen, K.D. Bovee and E.R. Irwin. 2001. Flow and habitat effects on juvenile fish abundance in natural and altered flow regimes. Ecological Applications 11: 179-190. Layzer, J.B., T.J. Nehus, W. Pennington, J.A. Gore and J.M. Nestler. 1989. Seasonal variation in the composition of the drift below a peaking hydroelectric project. Regulated Rivers: Research & Management 3: 29-34. NAI (Normandeau Associates Inc.) 1998. Relationships between instream flow and fisheries habitat in the Housatonic River, Connecticut. Report to Connecticut Light and Power and Northeast Utilities. Person, E. 2013. Impact of Hydropeaking on Fish and their Habitat. Thesis No. 5812, Federal Polytechnic Institute of Lausanne. Vollset, K.W., H. Skoglund, T. Wiers and B.T. Barlaup. 2016. Effects of hydropeaking on the spawning behavior of Atlantic salmon Salmo salar and brown trout Salmo trutta. Journal of Fish Biology 88: 2236-2250.